Morihei Ueshiba (14 December 1883 – 26 April 1969) was a philosopher, martial artist, author, and the creator of the discipline of Aikido. True Budo is to accept the spirit of the universe, keep the peace of the world, correctly produce, protect and cultivate all beings in nature. To smash, injure, or destroy is the worst thing a human being can do. The real Way of a Warrior is to prevent such slaughter — it is the Art of Peace, the power of love. 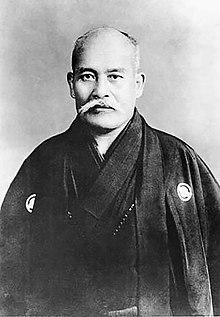 Atemi accounts for 99% of Aikido. I felt the universe suddenly quake, and that a golden spirit sprang up from the ground, veiled my body, and changed my body into a golden one. At the same time my body became light. I was able to understand the whispering of the birds, and was clearly aware of the mind of God, the creator of the universe. At that moment I was enlightened: the source of Budo is God's love — the spirit of loving protection for all beings … Budo is not the felling of an opponent by force; nor is it a tool to lead the world to destruction with arms. True Budo is to accept the spirit of the universe, keep the peace of the world, correctly produce, protect and cultivate all beings in nature. In a real battle, atemi is seventy percent, technique is thirty percent. The Way of the Warrior has been misunderstood. It is not a means to kill and destroy others. Those who seek to compete and better one another are making a terrible mistake. To smash, injure, or destroy is the worst thing a human being can do. The real Way of a Warrior is to prevent such slaughter — it is the Art of Peace, the power of love. When facing the realm of life and death in the form of an enemy's sword, one must be firmly settled in mind and body, and not at all intimidated; without providing your opponent the slightest opening, control his mind in a flash and move where you will — straight, diagonally, or in any other appropriate direction. Regarding technique, from ancient times it has been said that movements must fly like lightning and attacks must strike like thunder. Depending on the circumstance, you should be: hard as a diamond, flexible as a willow, smooth-flowing like water, or as empty as space. Foster peace in your own life and then apply the Art to all that you encounter. May the Kami of Earth and Heaven watch our acts of purification. In order to establish heaven on earth, we need a Budo that is pure in spirit, that is devoid of hatred and greed. It must follow natural principles and harmonize the material with the spiritual. 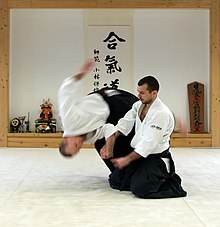 Aikido means not to kill. Although nearly all creeds have a commandment against taking life, most of them justify killing for reason or another. In Aikido, however, we try to completely avoid killing, even the most evil person. This page was last edited on 1 January 2018, at 21:24.